I have been using your system for five months as has my oldest son. My teeth feel incredibly clean now and my tooth sensitivity has disappeared , but I still have bleeding when I floss (no pain though). I am breastfeeding and had terrible acidic saliva while pregnant in spite off using xylitol in proper dosing. My baby is now 6 months old, but I wonder if nursing is still affecting my gums. I do not drink soda or coffee. Also, I have been using the Freshburst flavor of Listerine in your protocol. It has the ADA symbol, but I noticed you do not recommend it in your new ultimate guide and instead say to use original or cool mint. Why is this? Finally, my closys rinse always smells strongly of chlorine when I first open a new bottle but that smell dissipates after a few days. By the time it’s close to empty it has no smell at all. Does this decrease is potency? Hi Rachel, thanks for your message. Xylitol is only able to alkalize your mouth temporarily ( which happens each time you eat a mint or some gum). Xylitol can control plaque growth and make plaque less sticky, so it is easier to clean your teeth. But xylitol cannot alkalize your BODY – it can only alkalize your mouth. If your body is acidic ( as it is during pregnancy, during hormonal change, or during stress) then you may need some extra help to alkalize your body. Nibbling one Zellies mint at a time – after meals and during the day – can help your mouth as much as possible, but they cannot stop a mineral-depleted body from being acidic. Make sure your toothbrush is a good one, and very clean. When you brush – massage your gums on the outside of the teeth and also on the inside gums. You must stimulate circulation in your gums with your toothbrush! You need to bring all the healthy anti-oxidants, absorbed from your digestive tract, through the circulation, to feed the gums around your teeth. 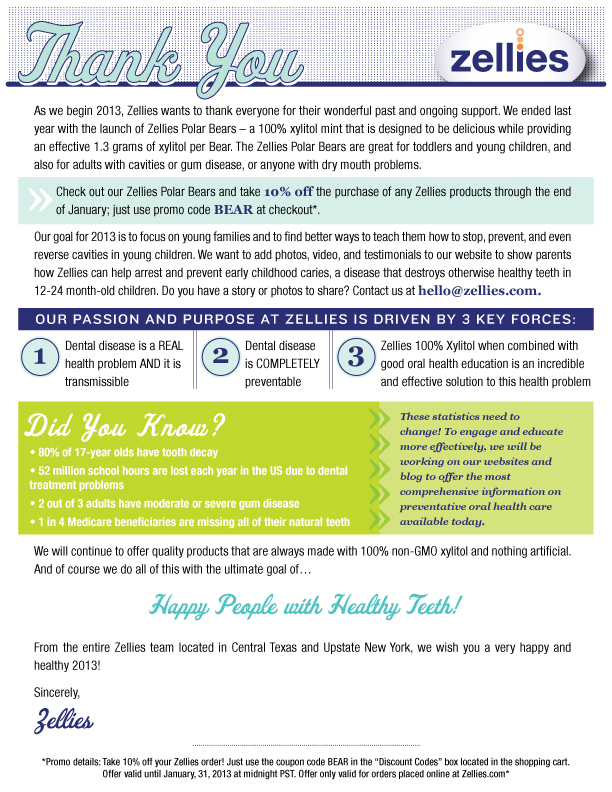 If you keep using Zellies Complete Mouth Care System in addition to careful nutrition, I am sure you will see a big change in your gum health. Don’t worry about the smell of Closys. Gently bathe your mouth with Closys for one full minute (not more) before your begin to brush. Timing is important. It takes a minute in your mouth to activate Closys with interaction with your saliva. I suggest the original and cool mint Listerine because I KNOW they work. I have no experience with the newer flavors. I have 30 years of experience with the older formulations. I only teach what I know works – because I have witnessed clinical results. You can try the newer flavors – but I cannot give you any guidance because I have no experience with them. They may work – I just don’t know. I recently came across an interview with Dr. Ellie and learned about her oral health system. My question is about the fluoride toothpaste and rinse. Over the years I have read many things about the negative side of using fluoride. You have also mentioned that your daughters teeth were damaged by it (the enamel forming cells) yet you recommend it in the toothpaste and rinse. Would you kindly respond to me regarding this as I would like to benefit from your insights but need more information to make my decision. No one wants to inhale chlorine gas – its poison. The idea of drinking chlorine in tap water is a worry also. On the other hand, there is a very stable chlorine compound, called sodium chloride. A tiny amount of this compound (commonly known a sea or table salt) is vital to keep us alive and healthy! Don’t confuse chlorine gas with table salt – even though they are both derived from the element chlorine!! Fluorine is a poisonous gas. I don’t believe in adding fluoride to drinking water. For infants, drinking fluoride can easily damage their permanent teeth. For adults drinking fluoride has different effects – depending on the acidity (pH) of the water, the metal in your cook pans, what KIND of fluoride is in your water, and – of course – how much water you drink each day! If you have perfect teeth and absolutely no fillings, no gum disease, and no problems (like mouth acidity or mouth dryness) – then you probably don’t need my help and don’t need to worry about fluoride!! On the other hand, if you have fillings in your teeth, then your teeth have been weakened. If you have mouth acidity or dryness your teeth can easily get thin, brittle, and your fillings or teeth may start to crack. A tiny amount of sodium fluoride applied to the outside of these vulnerable or damaged teeth can protect them and stop problems. I believe that a tiny amount of sodium fluoride – which you spit out – has FAR, FAR, less toxic risk than the dentistry and fillings your will need to repair cracked or damaged teeth. I hope this explains my position on fluoride – which is described in detail in the fluoride chapter of my book Kiss Your Dentist Goodbye.